TorrLube Oil - Inland Vacuum Industries, Inc.
TorrLube® Oil is an extremely pure Perfluoropolyalkether blend which is thoroughly distilled and then filtered through a submicron screen. TorrLube Oil has the ability to withstand thermal expansion and contraction as well as chemical and mechanical stress, while still maintaining consistent viscosity. These properties make TorrLube the ideal lubricant for bearings, automated slides, and screws that have a tendency to gall or cold weld while working under extreme conditions. TorrLube allows for a more efficient system, improving production and reducing maintenance time and costs. 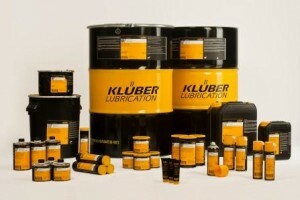 TorrLube Oil has a thicker film and carry higher loads than other types of lubricants. 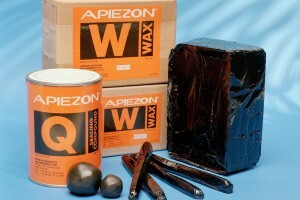 It is an excellent EHD lubricant because it thickens and gains viscosity when under load. Although TorrLube Oils are polymeric in nature, they do not break down when subjected to high rates of shear. 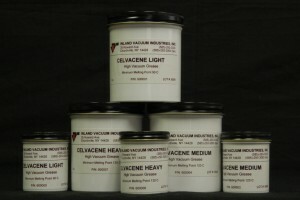 Irradiation at 10 kilocycles in a sonic shear tester for one hour resulted in viscosity changes of less than 0.5 percent. TorrLube perfluoropolyethers do not contain acetyl linkage groups (-O-CF2-O-), which are significantly more susceptible to chemical attack. The absence of -O-CF2-O- linkages throughout the entire polymer chain is a fundamental feature of TorrLube Oil. It is this feature that gives TorrLube superior stability when attacked by aggressive chemicals, such as the aluminum chloride. The pendant trifluoromethyl group provides shielding and further enhances the stability of the ether oxygen links of TorrLube Oil. TorrLube is a 500 cSt extremely viscous oil. The high viscosity allows engineers to condition O-rings with TorrLube, a pure PFPE oil, rather than a grease which uses a PTFE thickener. TorrLube’s high viscosity holds the oil in place, helping to eliminate oil “creep.” Because TorrLube is a pure PFPE, there are no Teflon® particles that will interfere with the process within the vacuum chamber. TorrLube oil has a working temperature range of up to 350°C, and can withstand temperature spikes of over 400°C for short intervals before it starts to decompose and evaporate. PFPE evaporation is generally less disruptive to a vacuum application compared to hydrocarbon greases. Each syringe contains 1cc of TorrLube lubricant with a #22 gauge blunt needle attached for close application. This size is ideal for use in small research units and for the tool kits of maintenance and service engineers. Syringes are packaged in a clean room environment and the needles are sealed to prevent contamination or leakage. Each cartridge contains 2 oz. of TorrLube Extreme Grease. Cartridges are sealed to prevent leakage and contamination. A plunger and 16 gauge tip are provided. TorrLube® is a registered trademark of The TorrLube Company. 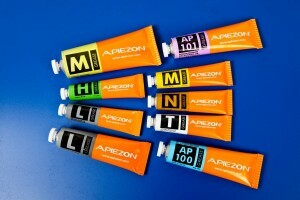 Apiezon® is a registered trademark of M&I Materials.